On May 6, 1977, R.C. Sproul (b. 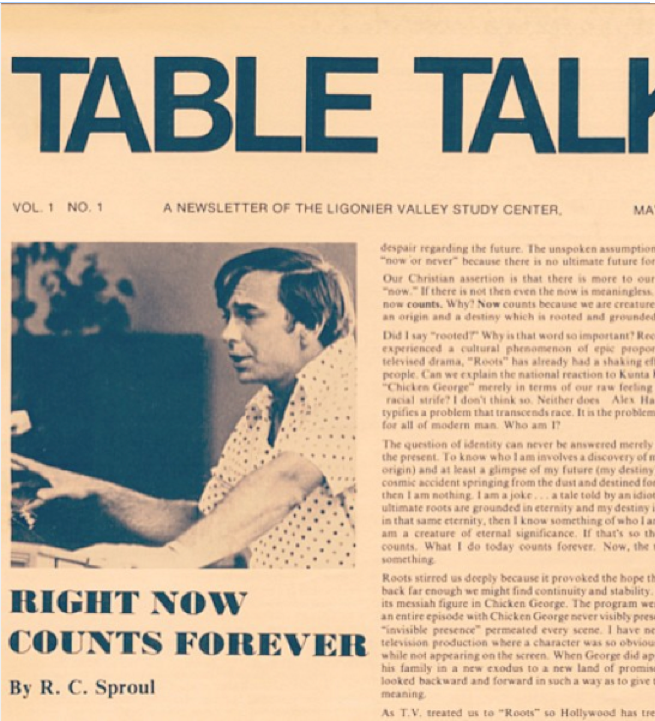 1939) and the Ligonier Valley Study Center launched the monthly magazine Tabletalk. On the 40th anniversary of this resource that continues to serve the church, we’ve asked Stephen Nichols—the President of Reformation Bible College and Chief Academic Officer at Ligonier Ministries—to offer some reflections on the magazine over the past four decades. Volume 1 Number 1 of Table Talk led off with a column by RC himself entitled, “Right Now Counts Forever.” Sheets of paper measuring 11”x17” were folded in half and stapled in the center—“saddle-stitched” as they say in publishing. The first edition had eight pages. Circulation was somewhere in the neighborhood of 80 to 100. Forty years later, Tabletalk weighs in at a 5.375″ x 4.125″ trim size, with seventy-five full-color pages that are still saddle-stitched. It has a circulation of 100,000, with a conservative estimated readership of 250,000. Circulation reaches over 50 countries. Copies may be found on coffee tables and kitchen tables in homes, in church lobbies, on military bases, in waiting rooms of doctors’ offices, and even in prisons. The copies in certain security level prisons have the staples removed. In an era of decline in print magazines, with many simply going under, Tabletalk thrives. At various points in the magazine’s history, consultants to Ligonier Ministries suggested that the magazine not lead with such heavy theological teaching and content. But Tabletalk zigged when much of the industry zagged. Over the past four decades, circulation has steadily increased. You can find all kinds of books and publications that are simple, but unfortunately they are simplistic, and with their simplistic character they’re filled with all kinds of distortions. It takes a lot of understanding to fully master a concept and grasp it so thoroughly that you can explain it to a child without distorting it. And so that’s the task, I think, of the teacher and the preacher: to explain the truth of God from an in-depth perspective, not just sliding over the surface or having the understanding only skin deep. The task is to go into the depths of the truth of God and to be able to do it without distortion. It is nearly impossible to look at the history of the magazine apart from Ligonier Ministries, formerly the Ligonier Valley Study Center, and apart from Sproul. Table Talk represents the concept of talking theology informally over meals as we do at Ligonier. Students eat in our homes. We believe that theology, the knowledge of God, is something for everyone, not just the pastor or professor, and that it can be talked about anytime, not just in the classroom or seminary. These two reasons are why the magazine is labeled Tabletalk. These two reasons also reflect the parent ministry and the parent of the magazine, RC. On the one hand, RC might have more in common with the Reformer John Calvin. RC’s thinking is more systematic and he is known for being precise—both about words and about theology. Luther was less that; Calvin was all that. Luther once said that Melanchthon, his protégé at Wittenberg, cut with the fine precision of a knife, while Luther himself swung wildly with an axe. But while RC thinks more like Calvin, he’s every bit Luther for this generation. Luther’s vision of the Reformation was for both pulpit and pew. He trained pastors, he wrote for pastors, and he exerted all efforts for a thoroughly and deeply trained clergy. He applied equal effort to the pew. He wrote hymns so the people of God could sing their theology. He preached not for the scholar, but for the laity—in fact for children. Luther once remarked that while his congregation was full of scholars, he didn’t preach for them, instead, “I just preach to Hansie and Betsy.” Luther grasped the deep doctrines so acutely, he could teach them clearly to children. According to Luther, the Reformation was for pulpit and pew together or all the efforts of the Reformation would be nothing but a clanging cymbal or a vapor that simply faded away. In those early years of Tabletalk, both matters of current events and of eternal consequence received attention. RC’s columns dealt with court cases involving the NFL, the sexual revolution, the American dream, Elvis, Bert Lance’s resignation form the Carter administration, and the Johnstown (Pennsylvania) flood. And that’s just May through December of 1977. In his landmark book, Classical Apologetics, RC speaks of mundum and secularum. Mundum means the place. Secularum means time. Not time as in chronos, but time as in the times, the cultural swing. We could simply say worldview. Secularism is the sadly mistaken worldview that this time, this moment, is all that matters. Through the centuries secularism manifested itself in various ways. It manifested itself with a vengeance in the 1960s with the sexual revolution. Harvey Cox published The Secular City in 1965. This was a time of violence and social upheaval as secularism offers no helpful moral compass. Watergate furthered the cynicism regarding institutions that once upon a time could be believed in. Liberalism dominated the mainline churches. American evangelicalism oscillated between rejecting culture (No long hair on men and no short hair on women!) and fully embracing it in order to be relevant. Tabletalk, the Ligonier Valley Study Center, and even RC himself need to be seen in this particular mundum and secularum. All three engaged the place and time in which they lived. What is singularly instructive is not that they did that, but how they did that. Enter Luther, the Reformation, and the Reformed faith. The Reformers were not innovators and proffering the novel. They advocated a return to the old paths, the truly ancient paths. The Reformers were timely—in their place and time—because they advocated timeless answers. We tend to be intoxicated with novelty. And this is what the apostle Paul confronted at Mars Hill at the Areopagus when he met with the philosophers who were meeting weightily to discuss all things new. And in our culture, if you want to get a PhD you have to come up with something new and a heretofore unstudied particularity for publication. What we’re trying to do is say things in a fresh way, but we’re not interested in novelty, we’re trying to tell the same old story from antiquity, from the Word of God that is timeless. It really is timeless truth that we’re interested in disseminating. In 1989 Tabletalk moved to its current trim size and began offering daily Bible studies and more columns. The thrust of the magazine has been in-depth doctrinal and biblical study for life, for application. You could put it this way: We learn of the holiness of God so that we might live holy lives. Each daily Bible reading has a point of application under the heading Coram Deo—before the face of God. This, by the way, is also why what we do right now counts forever. Every aspect of life is ultimately lived coram Deo. Stephen J. Nichols (Ph.D., Westminster Theological Seminary) is President of Reformation Bible College and Chief Academic Officer at Ligonier Ministries. He is the author or editor of twenty books, including A Time for Confidence (Reformation Trust) and Reformation ABCs (Crossway).